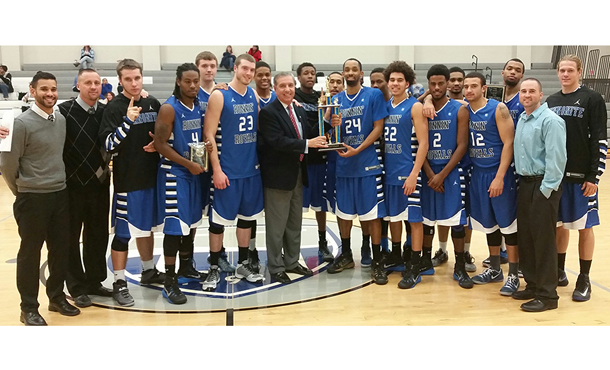 The Runnin’ Royals are heading into their Christmas break on a high note after beating Frostburg State 77-68 Sunday afternoon to win the Rotary of Frederick Holiday Classic in Frederick, Md. EMU has now won three in a row as they improve to 8-3 on the season. The win over the Bobcats (6-4) gives Eastern Mennonite a quality win over a Capital Athletic Conference team who had already beaten two ODAC teams: nationally ranked Randolph-Macon and Randolph College. The men took a bit to get their offense in gear and gave up back-to-back threes to quickly fall into a 6-0 hole. Their largest deficit was eight points, where it still sat at 26-18 with 8:29 to go in the half. James Williams (Capitol Heights, Md./Archbishop Carroll) buried a three pointer to get the Royals rolling, however, and Blake Steele (Front Royal, Va./Warren County) then scored six of EMU’s next eight points as they came roaring back. A Marcel Crump (Richmond, Va./Highland Springs) layup gave the men their first lead of the night at 33-31 with 3:59 showing. In all Eastern Mennonite ended the first period on a 22-11 run to take a 40-37 edge into halftime. Jerome Jones (Charles Town, WVa./Washington) nailed a pair of triples to open the second as the Royals extended their lead to 47-39. The Bobcats eventually snuck back to within three points at 55-52, but EMU turned on the defense to hold FSU scoreless for the next six minutes. By the time Crump threw down a dunk to cap a 13-0 run, the men had their biggest lead of the night at 68-52 with 3:33 to play. The outcome was never in doubt from that point, as Eastern Mennonite won their third straight game. The Royals had a sizable shooting advantage, hitting 45.3 percent of their attempts compared to just 36.5 percent for the Bobcats. The men were also 7-19 from long range compared to 6-25 for FSU. The free throw line was again a deciding factor, as EMU was 22-38 while Frostburg State rarely visited the stripe and finished 8-11. Crump scored a season high 23 to lead all scorers. He also charted his second double double of the season with 12 rebounds as he was named the MVP of the Rotary of Frederick Holiday Classic. Crump averaged 20.0 points 8.5 rebounds for the weekend. Jones finished with a career high 16 points and he hit four three pointers. The freshman was also named to the All-Tournament Team as he averaged 12.5 points and hit 7-of-16 treys in the two games. David Falk (Madison, Va./Madison County) was good for nine points and nine rebounds while Ryan Yates(Alexandria, Va./T.C. Williams) racked up eight assists with seven boards. Williams scored nine times while Steele finished with eight. Breon Powell led Frostburg State with 14 points and seven rebounds. Nick Smoot also scored 14, while Jabari Kamau had 12 and seven. After playing seven games over the first 21 days of December, Eastern Mennonite has an extended break for the holidays. The Royals won’t play again until traveling to Shenandoah on Jan. 7, a break of 17 days.